Donald Trump ended his presidential campaign in Michigan -- a traditionally blue state that has not voted for a Republican for president since 1988. Some dismissed the move, calling it a reach for the New York businessman. But apparently, the pitch worked. There's no telling whether the Republican presidential nominee and now president-elect could envision how electorally significant the Wolverine State and the rest of the Rust Belt would be in this race. In one of the biggest electoral upsets of modern political history, Trump won the presidency after a series of electoral college surprises. Polling ahead of Election Day in a number of states made the race seem closer, with Hillary Clinton pulling ahead of Trump. The evening began largely as expected. At 7 p.m., Clinton won Vermont and Trump won Kentucky and Indiana, the home state of his vice president Mike Pence. Trump won West Virginia at 7:30 p.m. and a half hour later, Clinton won New Jersey, Massachusetts, Maryland, Delaware, Illinois, Rhode Island and Washington, D.C. Trump scored victories in Republican strongholds of Oklahoma and and Mississippi. By that point, there had been no major surprises, and Clinton had a slight electoral college lead of 54 to Trump's 51. From there, Trump won South Carolina, Tennessee and Alabama -- all Republican strongholds. At 9 p.m., Clinton won the biggest state of the night and one that both candidates had desperately wanted in their column: New York. 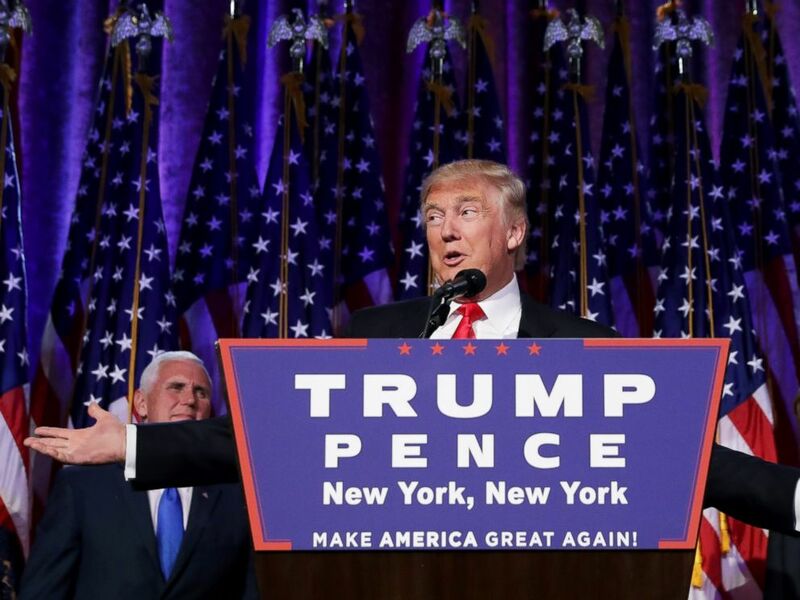 President-elect Donald Trump delivers his acceptance speech during his election night event at the New York Hilton Midtown in the early morning hours of Nov. 9, 2016 in New York City. Even though Clinton got the state's 29 electoral votes, Trump started securing a wall in the middle of the map with wins in Kansas, both of the Dakotas and Wyoming. That boost put him in the lead with 95 votes in the electoral college to Clinton's 83. Trump went on to win Arkansas, Louisiana, Montana and Missouri for a total of 27 votes; Clinton won the much smaller states of Connecticut and New Mexico, which only added 12 electoral votes to her column. One of the biggest moments came when Trump won Ohio and its 18 electoral votes. The Buckeye state is regularly viewed as a swing state, and it has a history of picking presidential winners. Ohio voters have accurately picked the presidential winner in 28 of the past 30 elections, including the last 13 elections. Clinton claimed the swing states of Virginia and Colorado, but she was still trailing with 117 electoral college votes to Trump's 140. Clinton got an expected bump with a win in California and its 55 electoral college votes. Hawaii's 4 electoral votes added to her tally. Trump then won in Idaho, but got a big swing state win in North Carolina. Even though Clinton was still in a lead with a win in Oregon, Trump was about to turn the tide. When he was projected to win Florida -- his so-called second home state -- his lead grew to 188 versus Clinton's 183. By this point, what had started as a select few electoral paths for Trump began to multiply and Clinton's started to narrow. The states continued to break along expected lines -- Trump winning Iowa and Clinton winning in the swing state of Nevada -- and that left Trump to win Utah. The night was basically Trump's at that point, especially after he won the swing state of Pennsylvania. The prospect of Clinton winning enough electoral college votes became less and less feasible. Clinton reportedly called Trump to concede sometime before 2:45 a.m., and Trump walked on to his victory stage after being called the president-elect by his running mate.